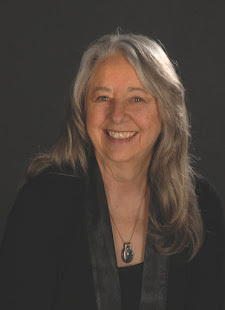 Joyce Wycoff Connecting through Art: Are these the two most important questions in art? Are these the two most important questions in art? "Creativity is how you love the world." That thought was in my head when I awoke this morning … a thought not just for me but for everyone. Whether it’s raising a child, planting a garden, cooking a meal, painting a landscape, singing a song, prepping for a complicated surgery, or planning a family vacation, bringing our full selves into whatever we’re doing is an act of creativity … an act of love. Yesterday, I watched a video from humanitarian photographer David duChemin where he asked us to think about what value our art brings to the world and who our “audience” is. I think the questions are useful for any of us, regardless of what we’re creating because it brings others into the creative process. And, we're all creating, every day. Creativity is that somewhat mystical process of bringing something forth from ourselves in service of someone or something else. It’s not just adding purple to apples because they would be different. It's asking how something within ourselves might create a new value that serves ourselves, our family, our community, the world? That means we have to know ourselves … and who we’re serving. What is it in ourselves that we want to bring forth and what value does the world need that might be served in some way by our offering. It doesn’t have to be curing cancer or solving the climate crisis. It could be as small, but important, as a moment of beauty and comfort for a loved one. Considering my own art and photography in light of these thoughts made me remember a story about the great wilderness photographer Galen Rowell. 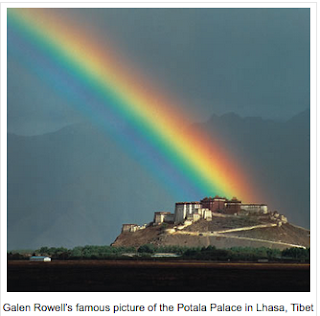 One of his most famous photos shows a rainbow ending at the Buddhist Potala Palace in Tibet. The story of how he took this iconic shot included him running miles to be in place at the exact right time to capture the rainbow touching the monastery. I am thankful that we have photographers such as Rowell who show us bits of the world we would never ever see ourselves. However, as much as I love their photographs, I know that I will never be one of those photographers who takes us deep into the wilderness, shows us glorious landscapes, or breath-taking action events. All of this threw me into reflection. While most of my photography and art has been in reaction to wherever I was and whatever I was seeing, it now seems time to answer the questions: What do I want to share with the world? What legacy do I want to leave? And reminds me: I do not have time to not have time. I don’t think I’ve been ready to address those questions before now because I didn’t take myself seriously as an artist. I was just messing about occasionally creating something that pleased me. 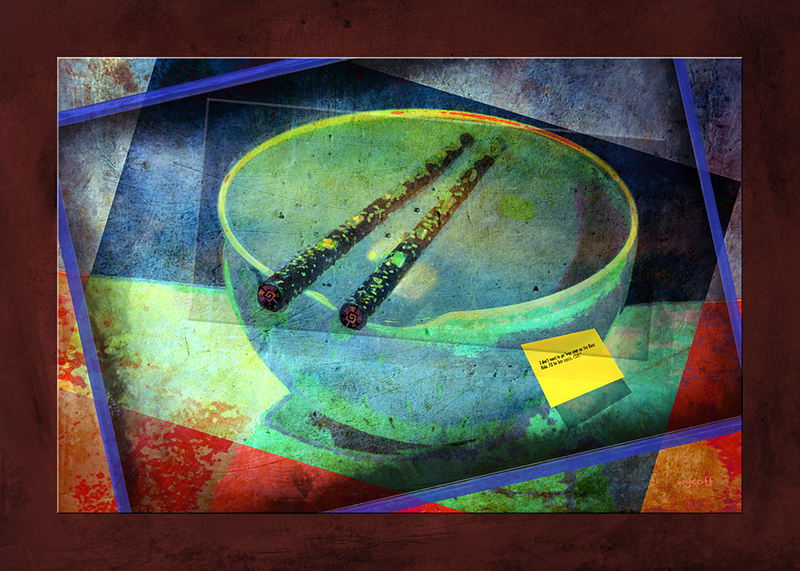 Now, however, at 71, I realize it’s time to accept the next step on this journey … intentional art. Creepy scary, but exciting. And, this has nothing to do with talent or “art,” it’s simply about me bringing forth pieces of myself in the most joyous fashion possible and with the intention of serving myself and others. A momentary hiccup: wouldn’t it be better if I used my time and talents to resist the strange political happenings in the world … or serve in any of the many humanitarian organizations here where I now live? There is a wonderful world of activism art … but, sadly, that doesn’t seem to call to me. I wandered through the maze of Googleland trying to find an answer to this hiccup and found an article by Jessica Davidson titled “Being Creative in a Mad World.” It’s a great article which I think she boiled down perfectly when she said, "The only way to respond to such rampant insanity and myopic destruction is to create.” There are a thousand ways to create a better world. However, the one that seems to match my skill set, passion, and temperament is photography and digital art. She also says: As you create, so the world becomes. When I read that, a voice in my head said … see, permission to do what you love. The world will go on. It might even be better … you’ll be one less person not doing what they love. So back to figuring out what my intentional art is. Writers are told to write from what they know and love, even if it means inventing a world of simple folk chasing about the world after a golden ring. What has thrilled me since first picking up a camera more than 50 years ago was capturing color and beauty, big and small, especially the bits that often go unnoticed, with the primary “unnoticer” being me. Gradually, photography made me more aware of the world: the colors, textures, lines, contrasts and patterns. Sometimes I think I was born blind and have only gradually come to see the amazing diversity and beauty of the world around me. I’m probably never going to see Galen Rowell’s Tibetan monastery or most of the other wonders of the world. However, if I can learn to see the beauty in everyday things, maybe that will be enough. The Spanish language has a beautiful word: cotidiana, which basically means ordinary, everyday things and customs. And, the word for beauty is belleza, Belleza Cotidiana. Everyday Beauty. If I can focus on seeing the beauty around me and bringing it into art that brings me joy and connects with others who possibly have that sudden shock of recognition of beauty in an ordinary thing, maybe that’s suficiente (enough). Message on a Bowl … the sticky note says: I don’t want to go ‘way over on the East side. I’ll be late again. Cliff. A minor mystery ... who is the note for? Where didn't he want to go and why? Why is he late ... again? Who is sitting there looking at the bowl, and what is she/he feeling? 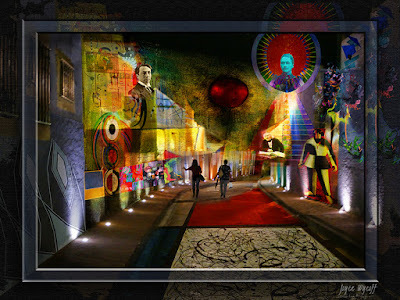 To see and to create Belleza Cotidiana sounds to me like a deep sweet purpose, dear artist friend. Thanks ... and fodder for Juntos Salon.